IRC/Import Repair Center Offers Auto Repair Services You Can Count On! Since 1973, IRC/Import Repair Center has provided motorists in the Sacramento, CA 95825 area with comprehensive auto repair services that include 4x4 Services, Alignment, Brakes, Car & Truck Care, Domestic Cars & Trucks, Electrical Services, Electronic Services, Engine & Transmission, Engine Maintenance, General Services, Heating and Cooling Services, Import Cars & Trucks, Inspections and Emissions, Miscellaneous Services, Muffler and Radiator Repair, Quick Lube Services, Tires, Towing, Transmission Services and Undercar Services. Our goal is to offer the best services available at affordable prices to get you back on the road in no time. High standards and professionalism resulted in high ratings from AAA and local publications. IRC/Import Repair Center was founded by Jim Olinger, Sr. in 1973. Dedicated to provide a family owned and operated full service shop for Asian and Domestic automobiles and trucks. With Jim Sr.'s guidance, Jim Jr., Ted and staff strive to provide the best service in the Sacramento area for all Asian and Domestic makes and models. 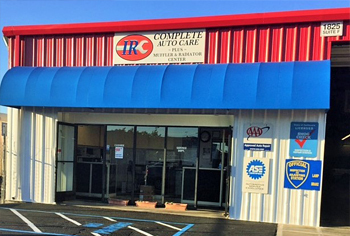 IRC/Import Repair Center is a full-service auto repair and preventive maintenance center. We have been performing our high quality and guaranteed auto repairs in the Sacramento and Sacramento area since 1973. We are conveniently located for your service and maintenance needs and we are qualified to repair and service all domestic and imported cars, trucks and SUV's using parts that are equal to or exceed the standards of those parts originally used by the manufacturers. We are definitely the cost-effective alternative to car dealership servicing for all scheduled maintenance of your personal or company auto, pickup or truck. Regardless of where it was built, we will service your vehicle and still maintain the manufacturer's warranty. IRC/Import Repair Center is independently owned and operated. We pride ourselves on getting the services or repairs on your car, truck or SUV right the first time by our highly qualified service technicians. So drop your auto, SUV, or truck off today and allow us to provide you with excellent service. We look forward to servicing your vehicle. For a high-performing vehicle, trust IRC/Import Repair Center with your car, truck, or van. To learn more about the services we offer, please contact us by phone at 916-487-7801 or send us an email. We also invite you to learn more about our dedication to you, our valued customer.